Maurizio Sarri has warned Chelsea to be careful about Arsenal ‘s “dangerous” attack and suggested Eden Hazard could start over Olivier Giroud at the Emirates Stadium. Chelsea take on their London rivals Arsenal on Saturday with both teams locked in a battle for a Champions League spot this season. The Blues hold the advantage as they currently sit six points ahead of the Gunners, who have suffered from a poor run of results since seeing their 22-game unbeaten streak ended by Southampton in December. Despite that, Arsenal possess forward Pierre-Emerick Aubameyang in their ranks – who is level with 14 goals with top scorer Mohamed Salah and Harry Kane this term. And the Gunners’ attacking options worry Sarri, who has called the match on Saturday “important” but risky for Chelsea and their hopes and ambitions this year. “At the moment we have, out, only [Ruben] Loftus-Cheek with his back, as you know. This match for us is a risk, and an opportunity,” he said. “A risk, of course, because they’re doing very well at home, so it’s a very difficult and dangerous match for us. And, as you said before, it’s a great opportunity for us. “So the match is very important, very difficult because they are really a very good team. Chelsea and Arsenal met back in August, in what turned out to be a thriller of a game, as the Gunners came from two goals down to threaten to secure a 2-2 draw at Stamford Bridge. But Marcos Alonso struck in the 81st minute to hand Chelsea a narrow win, and Sarri admits the Blues have been working on ensuring they aren’t caught out against Arsenal this weekend when full-backs Alonso and Cesar Azpilicueta push forward in attack. 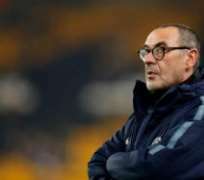 “In August, this was a difficult match, I think,” Sarri said. “They changed in the last seven or eight matches. But we learned that they have a really very, very dangerous movements in the offensive phase without the ball. Very dangerous. Especially when our full-back is out of the line to recover the ball. He added: “Marcos in that match scored in a very unusual action for us. So it wasn’t by chance, but…. similar. The game at the Emirates Stadium provides Giroud to return to his former stomping ground, although whether he starts remains a doubt. Sarri has, in recent weeks, opted to play Hazard up front as a ‘false No.9’ despite Giroud being fit and suggested he could do the same against Unai Emery’s side on Saturday due to his desire to have better balance on the pitch. When asked if Giroud will start against Arsenal, Sarri replied: “I don’t know at the moment.